How would you like to win a Kindle Fire? Well, I’ve got TWO to give away! To celebrate the premiere of season six of Lifetime’s popular show, Army Wives, I’ve got TWO Kindle Fires–with an Army Wives branded Kindle cover–for TWO lucky winners! This contest will run from now through Saturday, March 17, 2012. That gives you lots of chances to enter, which ups your chances of winning! See all the giveaway details below. 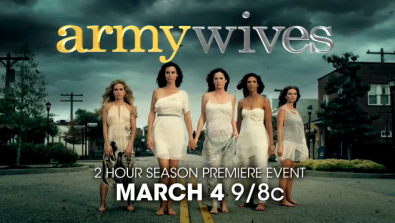 Season six of Army Wives premiers tonight, Sunday, March 4, 2012 at 9:00 pm EST / 8:00 pm CST. DISCLAIMER: I have watched quite a few episodes of Army Wives, and do not remember any inappropriate content. In fact, there were two instances where extramarital affairs were considered and were quickly shut down by the characters. However, I would not consider it “family” entertainment, but rather more of an adults-only show. Have you watched the show? What do you think about it? Enter for the chance to win one of two Kindle Fires with an Army Wives branded Kindle cover. See all the details below. 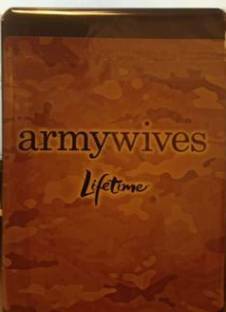 A&E Networks is offering TWO KINDLE FIRES with an Army Wives Branded Kindle Cover to two randomly selected winners. The winner will be announced on Monday, March 18, 2012. Faithful Provisions Giveaway Disclosure: A&E Networks sponsored this giveaway by providing two Kindle Fires with Army Wives branded Kindle covers for me to give away. For more information about Faithful Provisions, please read my Disclosure Policy. 1. COMMENT: Leave a comment honoring an army wife you know, or leave a message of thanks to our troops! 3. TWITTER: Follow Faithful Provisions and Army Wives on Twitter. 4. FACEBOOK: Follow Faithful Provisions and Army Wives on Facebook. GIVEAWAY ENDS Saturday, March 17, 2012, 11:59 pm CST. The winners will be drawn using Random.org. The winners will be notified via email and the name will be posted on Sunday, March 18. My husband is in the National Guard and has been deployed twice. Thank you so much to all our troops and their families for what they do for our country every day! Thanks to all those who served or are now serving! A heartfelt thanks to our troops AND to the families left behind. I am blessed to have several friends in the military!! God bless them! I do not personally know an Army wife, but my life has been impacted through military contact within my family and one of my friends. I do want to thank all the men and women that serve in all the branches of the military. They are what makes everyone free. So to everyone out there serving our country here’s a big THANK YOU! May God watch over and protect you and your family. I’d like to honor a special friend of mine, Stacey, who is an Army wife. She has 3 kiddos at home and her hubby has been deployed a lot over the past 3 years. Like me, she is on a weight loss journey and has already lost over 75 pounds…she hopes to reach her goal weight by the time her hubby returns in the Fall. Thank you to all of the men and women who serve our country and to their families who sacrifice so much in return. Your efforts are not in vain! I think Army wives have a hard job and life…I honor them! I want to win one of the Kindle Fire for my elderly Mother, so I entered by thanking the troops. I honor the troops for ensuring our freedom! Thank you for risking your lives for all of us!!! I want to win one of the Kindle Fire for my elderly Mother, so I entered by subscribing to your e-mal newsletter. I want to win one of the Kindle Fire for my elderly Mother. I have been following you on Facebook for awhile now. Thanks to all the family & friends of mine that have served our country both here and abroad for many years! Three cheers for the red, white and blue!!!!! As a military wife, I have to give a big shout out to all those serving our country. Thank you! My heartfelt thanks to all those who serve in our military, protecting our freedom and sacrificing so much! I want to thank their families too, who miss them while they are serving away from home! My brother is in the Army and is about to make his third tour, this time in Afghanistan, and leave behind his wife of two years. Prayers and thoughts to all the service men & women and their families. I just signed up today for your newsletter. A big thank you to our service men and women. Thanks for all you do. I follow Faithful Provisions and Army Wives on Twitter. I just sent a tweet about the giveaway! And, I follow both on FB. Thanks! Thanks to all of the men and women who sacrifice their lives so we can live ours without fear! God bless each and every one of you! I would like to Thank Our Troops for fighting for our freedom. I don’t think there is ever a way to say “Thank You” Enough. Thank you to my family, my friends, and eveyrone else out there who has served. I receive you daily e-mail newsletter. I am forever grateful to our troops… and wrote a blog called, “Thank You” a few years ago. While driving down I-24 in Nashville near Harding Place in the rain, I passed a convoy of soldiers. At the time, there was a lot of protesting against our troops (particularly by one woman who had lost her son in batttle) and so forth going on. I wanted to instead say thanks. It was raining and cold outside, but I decided to encourage our friends in camoflauge. So, I rolled down the window on the drivers side, extended my arm and made a thumbs up motion. I kew they would see it because I had on a red jacket. Then, I honked the horn and began yelling, “Thank You! Thank You! !” When I realized they saw me, I snapped the best salute I could muster. What happened next took my breath away… A soldier popped up out of the tops of one of the Hummer mini-tanks and saluted ME!!! Remember… it was raining and cold. He remained that way until I was out of site!!! I have never failed to stop and shake the hands of our troops and look them in the and say a heartfelt thanks since! I follow Faithful Provision and Army Wives on Twitter. I know a mom who’s an Army wife. Her hubby has been deployed at least 3 times in the past few years and she does an incredible job of holding down the fort for their 3 sons while dad is gone. I follow Faithful Provision and Army Wives on FB. I already receive your newletter. Love it! Hi! I’m a subscriber. Thanks! SO thankful for the men and women who have given their lives, time, and devotion to our country! Thank you to our wonderful troops scattered all around the world. Thanks for all you do everyday. A huge thanks to all the men and women serving our country who help keep us safe and give us our freedom!! I already subscribe to your e-mail newsletter. I posted your link in my fb status. Follow Faithful Provisions and Army Wives on Twitter. Follow Faithful Provisions and Army Wives on Facebook. Thanks to our troops and their families! God Bless and protect every man and woman that are bravely serving our county so I can have freedom. You are in my prayers everyday. I would like to send a heartfelt thanks to all those who selflessly serve and protect our country…along with their families and the sacrifices they have made being away from their loved ones. God bless you all! Thanks to all our armed forces and their families for the sacrifices they make for our country! Thank you, troops! Your service and sacrifices are not taken lightly! My friend Donna has a husband and two sons in the military – and she has worked as a nurse at the base in Weisbaden, Germany when they lived there. Great family!! I am a newsletter subscriber and really enjoy it. I like the mix of couponing, recipes and scripture. I would like to honor my friend Melody who has spent loooong periods of time away from her husband and completely supported him in his decision to join. I want to thank all those serving in our military for the incredible sacrifices they and their families make! I’m proud (and ALWAYS have been) to be an American and am so thankful for the soldiers and their families for their sacrifices they make for our country. God Bless them all!! Shout out to lots of military wives…Karen, Cathy, Felicia, Emily, Wanda, Rebecca and so many more!! Thank you to all the men and women serving our country. Your time and sacrifice allow us to maintain our freedoms and for that I am truly grateful. I’d like to thank our troops for the security we have today. There’s a man in my church who just came back from Iraq and just by watching him I can tell where he came back from was a terrible place… he rarely smiles and often has this sad look on his face. So thank you, the military, for relieving us from experiencing the same! I follow Faithful Provisions & Army Wives on FB! I follow faithful Provisions & Army Wives on Twitter! Thank you Army Wives (and spouses of all other branches too.) We appreciate the sacrifices and struggles you make. Thank you, soldiers for your protection! I get the Faithful Provisions newsletter! Army Wives Roxy Sally Pressman cracks me up all the time! And many thanks to our troops! I follow Faithful Provisions and Army Wives on Facebook. I have the upmost thanks for all our military! My deepest thanks to all military men & women and their families! Your hard work and dedication to our country is greatly appreciated! My boyfriend has been deployed once a year, every year, since we’ve been together. Thank you to all of the brave men and women who protect and serve our country, dedicating their lives so we can can live ours. God bless all those who have served or are serving our country! Thanks to all the troops out there that keep us safe. What would we do without you? I receive your e-news letter! God Bless our troops and their famiies!!! My father, brothers, and husband have all served, I have met many men and women who have sacrificed for our country. Thank you to all of them! Posted this giveaway as my facebook status! We forget that our soldiers have family at home, these wives keep the family together here at home. THANKS!!! to all the wives of our soldiers how work so hard here at home. God Bless you!!! My grandma met my grandpa while he was in the Army and she in the Navy. Married 59yrs and she passed away two weeks ago. I am an email subscriber to Faithful Provisions. Love faithful provisions and army wives! I follow both Faithful Provision and Army Wives on Twitter! SO thankful for the many men and women who sacrifice daily for our country and to their wives who provide and take care of their children and homes while their spouses serve. I follow both Faithful Provision and Army Wives on Facebook! My husband retired from the Army and I continue support our brave troops who fight so hard for our freedom. Go Army! Both of my brothers are in the military (one is army and one is marines) so my sister-in-laws have been through quite a bit. My brother that is in the Army has been deployed twice and my brother that is in the marines has been off on a ship a few times. My sister-in-laws held their homes together while going to school and taking care of kids. I definitely look up to them! My nephew is currently serving in the US ARMY. My dad served the army and my best friend’s husband just retired as master sgt of the air force. Following on Facebook, subscribed to newsletter. Thanks to all who serve our wonderful country and fought for our freedom every day. May God bless you and your families for your sacrifice. I am so thankful for our troops and have some friends that are army wives. I do not know how they do it. My best friend’s daughter was an Army wife for several years. Her husband’s job was depicted in the movie The Hurt Locker. Army wives are single parents while their husbands are deployed, they have to take care of the finances, the home, and everything, alone. I thank them for their sacrifices as well as our troops, deployed and on US soil. Thank you all for your service and may God give you strength and keep you safe. I have received your newsletter for years, thanks for all the great info! I stand in awe of every Veterans wife I’ve even met and what they also must endure. I would like to thank my husband for his service in Iraq. Thank you to all of our service men and women. My best friend is an Army veteran and an Army wife. who encourages me in every way! What an amazing opportunity! I am a Air Force wife.. I know several army wives as well! My dad is a former marine and my brother is currently a marine and just came home from a tour in Afghanistan. My husband has also served deployments and is coming up on another one in 3 months 🙁 Part of the life. Thank you for the opportunity. I am thankful to all the men and women who serve in our each branch of our Armed Forces. We are blessed to have them protecting us. I pray that God will protect them and their families. Thanks to all who protect our country! I love my freedom thanks to all the military that defend our country!!! I do not personally know any army wives/husbands, but I am so thankful for the support that they give their spouses. And their spouses…..what can I say but…..THANK YOU! Thank you to all who serve or have served in the armed services! I subscribe to your newsletter already!! I follow you and Army Wives on FB!! I would like to honor my friend, Jada. She has 3 children at home and a son who recently joined the Marines. Her husband, Brigham, is currently deployed for the 3rd time. She is an amazing woman! Thanks to all of our troops, past and resent, working to keep freedom safe and thriving. I follow both on twitter @rusthawk. Proud wife of Army retiree, James Durham, who served faithfully for 26 1/2 years, would LOVE to win a kindle fire! Thanks to all those who served or are now serving and to their families!! Thanks to all the army wives that run their households alone while their husbands are serving for us. I Follow Faithful Provisions and Army Wives on Facebook. Jamie L. H.
An Army Wife I know, Leslie Williams, has two sets of twins! I worry for her constantly. I am proud of my husband who served as a marine and I appreciate the sacrifice all the military personnel and their families do to keep our country safe. Thank all of the military wives but especially my mom. She followed him to many bases all over the world and waited on daddy many times here in the U.S. while he was away for 22 years. She did this proudly with a smile on her face and never complained. I already receive your newsletter. I would love a Kindle Fire!! It would help me as I am finishing school. I could download all my books to it. Thanks! Thanks to all those who serve and served the country! My aunt was an army wife. She is an amazing woman, and has an amzing family. Also, I want to add, Thank you to all our Troops who are out there representing the USA and thank you to our Troop’s families who love them and worry about them and patiently await their return home. Also thank you to the families who have lost loved ones who have served. Thanks to all the troops who serve our country, and all the spouses and families who support them! I don’t know any Army Wives, but a big Thank You to all our troops who do so much for us! Follow Faithful Provisions and Army Wives on Twitter. (BethsBookReview). Follow Faithful Provisions and Army Wives on Facebook. (Beth Book Review). My brother just enlisted in the Army. Love our troops!!! I was once an Army wife and the friends I made during those years are still my friends to this day. They are fiercely loyal, amazingly independent, and courageous in keeping the home front fires aflame. My admiration for the many who faithfully serve. I love your Facebook page and website! Thank for all you do! As an Air Force wife myself, I know how hard this lifestyle is. Thanks to all the other military families for everything they do to keep us safe! My father was an ARMY chaplain,now retired.My mother was the greatest Army Wife I know. I’m following you and Army Wives on twitter. Lorayne Chelsea McCarty- Gothard shared a link. I like your page and Army Wives page on Facebook. Proud of our military people! I am a follower on facebook and an email subscriber. Thank you for all the work you do for us. So grateful for the troops and their families!!!!! I would like to thank my college roommate who is now the wife of an army chaplain. She stands by his side and serves daily with him. I’d like to honor a young friend of mine, Jerri Lynn. She’s been a military wife for one year and before that she waited for her guy to come back to her-which he did. She shows great strength. And she’s a sweetie. This comment is honor of my brother who has done numerous tours of duty around the world, I miss him and am so proud of his service. Thanks to all of those who served our country, including my friend Amanda! So thankful for all the soldiers and their families that support them. I am so thankful for all the army wives you serve our country alongside their husbands. I do not know any army wives, but as the wife of a retired marine I have the pleasure of knowing some marine wives. I cannot thank our troops enough and their families back home for the sacrifices they make on a daily basis for the rest of us to have the freedom we do. Thanks to all the real life army wives! I can’t imagine being in your shoes. Thank you so much for the sacrifice you make. i am a subscriber to the faithful provisions newsletter! I love it! A huge thank you to all who serve to protect our nation. We are so blessed to be living in a country where there is freedom. Thank you to those who have gone before … and those who are currently serving. My college friend, Parice is an Army Wife. I salute her! Also, my cousin Kristy and friend Jay who are currently serving our country. I like army wives fb page! Thanks to all of our troops and their families! Thank you to all of our troops and their families for everything they sacrifice for our freedom. I already subscribe to the email. I am an Army wife and veteran. I thank the Lord everyday for the men and women who serve our country. Because of the sacrifices they make everyday, I am able to live in a safe United States. God bless our military families! So thankful for all the troops and their families for the sacrifices they make for us! Thanks to all the men and women that proudly serve our country. I am glad that ARmy Wives has returned. I subscribe to your email also. Thanks for all you do! I apreciate the sacrifies our troops and their familes make every day to keep our country safe. My friend, Elaina, is a military wife…her husband has served several tours and she never ceases to amaze me with her strength and steadfastness! They have three children and she is going to school for nursing, she is incredible! I do thank from the bottom of my heart, our brave men who serve us and give up their lives, families, their all for our country!!! Thank you isn’t enough!!! Heather Smith is an army wife & an army chaplain! She is remarkable! I would love to win. Proud army wife. I receive your email updates! So thankful for all of our troops, but especially my brother in law, and his wife Ashley, who took care of their two kiddos while he was shipped off for his tour. What an amazing strong woman! After seeing the movie, Act of Valor, I was reminded of what a great sacrifice our military people make when leaving family and loved ones; AND what a sacrifice the family and loved ones left behind make. I truly appreciate what has been done, but can never see the depth of what has already been given. My Mom was active duty Army. She is one of the strongest Army Wives I know! Being a former Army Wife….all of the ladeis who have been by their husband side during their time fo service to our country deserve a HUGE thank you! I have a sweet friend who really stands out and what she is trying to do for wounded warriors across the country- Jessica Allen. Read more about her in her blog: http://www.adventuresofteamallen.blogspot.com/ . I am already signed up for your newsletter. Thanks for the awesome giveaway! I am following Army Wives and You on Facebook! I posted the appropriate status. Thanks again for this giveaway! I would love to win and give it to my mom! posted on FB about a chance to win! I don’t know any army wives, but I am thankful for all the families that have loved ones in the armed forces. I truly appreciate the sacrifice that the soldiers and their families make. I’m a proud Army mom, Marine aunt (one is currently deployed), and Army Wives fan. Can’t wait for the premiere! I am the proud mother-in-law of a wonderful, strong and courageous Army Wife. She and my son where married in July and he deployed in September. She lives with us and has been such a blessing to our family. I receive Faithful Provisions email newletters. Thank you to all the soldiers and families of our awesome Armed Forces! We have a long family tradition of military service, both my grandfathers served during WWII, my dad was Navy, my husband is Army. My Hubby is Retired Air Force. I Appreciate all our Military Families Past, Present, and Future. Thank you for our Freedom! Thanks to the few that I know who have served in the armed services. You make us so proud! Thank you to those who serve in the military! I appreciate all you do to keep us safe. Thanks to my wonderful husband for serving 18 years and still going strong. HOOAH! In memory of one of the best Army wives I know… my mom. You never complained. Thanks Mom! I am very thankful for all our army wifes and troops who keep us free!! So thankful for our troops … AND their families. They sacrifice SO much for our freedom. God bless you Military Wives! I appreciate all that our troops and their wives do. I enjoy watching Army Wives but am unable to watch my favorite program anymore. We had to budget and now do not get cable anymore! And unfortunetly I can’t watch the new programs on internet. I am blessed having several people who are in the military and have Thanked them for their service, many times!! I have a friend who is an army wife. Her husband is currently deployed in Afghanistan. She continues to be upbeat and positive, despite her circumstances. Proud Army wife of soldier husband! I am a teacher that loves to read! I would love to win! I’m thankful for my little sister and her husband who served in the US Navy. I left a comment earlier but can’t seem to find it. As of this morning, I am a FB follower. I heard about your site from my MOPS group. Can’t say thank you enough or even express gratitude enough to all those that sacrifice for our safety and freedom! I’m not only thankful for all the troops but for the families who are “serving” right along with their spouse. Thanks to not only our troops but also their families. Thanks fjor the sacrifices you make so that we can enjoy our way of life. Love your newsletter! Very thankful for everything our troops and their families to for our country! I have already signed up for your newsletter. Thank you to our soldiers AND to their wives who hold down the fort here at home! Thank you to my awesome BIL, and to all of our armed forces, bravely protecting and serving our country! My mom is an “army wife” I’m proud to have in my life. Thankful to God for all those who serve in our military! We are blessed! Thank you to all who have served, who are serving and those joining the military! A special thank you to everyone serving in the military. I follow Army Wives and Faithful Provisions on Twitter. I like Army Wives and Faithful Provisions on Facebook. I’m so excited for this giveaway! Thanks! I’ve just gotten home from the movie –Act of Valor. I cried it was so good! I’m so very thankful for the many military who sacrifice their lives for my country! I <3 Army Wives too! I follow both FaithfulProvisions and Army Wives on facebook. Thank you to all of the members of our military and their families. They are indeed special people. Thank you to our troops!!! Such a big fan of this show. If it wasn’t for the wives the men would not be able to do their job. I am very honored to have veterans in my family and i am very thankful for all that they do everyday for our freedom! I honor my father who was in the service and my father in law. It took men like this then and the men and women that serve now to preserve our rights and freedoms. Thank you so much for all that you do! I love the show! My favorite character is Roxy. Thanks to the troops for everything they do day and night to help us stay free. I follwow u on FB! I follow Army Wives facebook page. I support our troops and pray for them and their families! Thank you troops for keeping us safe!!!! What a blessing our troops are!! I appreciate several Army wives because of their sacrifice of time with their hubby for my freedom. A shout out to Alisha and Bethany! I have several friends who are Army Wives & I can’t even imagime dealing with everything they deal with. They are just as much heros holding down the homefront with the guys are away. I am in awe of them. I follow you & Army Wives on fb! I follow you & army Wives on twitter! Thank you Army wives for sacrificing for our freedom. We know that it is difficult being a single mom with a husband in harm’s way. Thank you! Every time I complain about my hubby and I working opposite shifts and raising a family, I think about an army wife. Who, for the sake of her family and so many others has to parent on her own till her hubby comes home. I am also a huge fan of this show! Hats off to all military spouses. I would like to take a moment to honor all the troops and the families that they leave behind! Thank you for your service and dedication. I posted to facebook the message. I am thankful for Godly Army wives such as Becca Sanderson raising 4 kids while her husband serves our country. Thanks to all of our hard working troops! Thank you to all the military wives for being faithful while your men serve our country! I am extremely grateful for our troops and what they do for this country! I subscribe to your newsletters! I work with a wonderful person who graciously gives to all of us. Her husband has done a tour in Iraq and now he is headed out again. She never complains at being left to care for things here with their 3 children. On top of her husband leaving again, she has agreed to give one of her kidneys to her father-in-law. The surgery will be this week. She just absolutely amazes me with her ability to give, and give, and give. Thank you Laura for being an excellent example for other Army wives and for us all. My sil is an Army wife and amazes me on a daily basis. I never hear her complain about the deployment or the next one. I am a Army brat and AF wife. I never could do what she does. I love her to pieces. I pray for her,her hubby and her 3 girls daily. Thankful for her hubby’s service . I follow your newsletter, thanks for all the tips. Thank you so much to the troops that serve daily and the families they leave behind! I am a proud USAF sister! Thank you troops for all you do for us and our country!! Blessings on Patrick and Melani…Patrick is overseas in the army chaplaincy while Melani is taking such good care of their three kids stateside. Love you and appreciate you!!!! I like Faithful Provisions and Army Wives on fb! My grandmother was an army wife. We love our troops!! I am the wife of an army soldier who was deployed during two wars – Persian Gulf and Operation Iraqi Freedom. Love your blog!!! I posted the kindle fire link on fb. I would love a kindle fire! My daddy was a marine, my stepfather was in the Vietnam War, and my husband was in the airforce before I knew him. I am very thankful for all that the military does to keep us safe. I posted the giveaway on my facebook status. I don’t know any army wives, but I have a couple of friends whose husbands are in the military. I give those ladies (and their husbands) LOTS of credit for all they do! I don’t know any Army wives personally but do know several people who serve in the military….one of which is my nephew who is a Marine. My thanks go out to all of our troops for their service! Thank you to all who have served and are still serving. Follow you and Army Wives on Twitter. My cousin is an Army wife in Georgia. She went through her whole pregnancy while her husband was deployed, and now has a 1 yr old little boy. Her husband is now home. I admire the strength of Army wives! Our family is very thankful for all our troops. Thanks for the chance to win a Kindle Fire! And thanks to the troops and their supportive families for all they do. Army wives has been a favorite show of mine since I was one. ;). My husband was deployed three times in our marriage, missed our last sons birth, and still feels the pride in our nation to continue teaching our youth as a JROTC instructor. I am so proud of him and all of our military! I enjoy your website. Keep up the good work! A huge thanks to all our troops! I respect and have much gratitude for all of those serving our country in the armed forces! To Jasmine, Stacey, Jeni, Michelle, Rebecca, Tamara, Rebekah and my other real Army wife friends and UMT family you make these deployments a lot more manageable and bearable. Thank you Lord for such great friends!! I am so grateful for the dedication of our troops. If my son chooses the military, I will be so proud of him. I follow FP and AW on twitter. I would like to thank all the troops for fighting for us. I am praying for them & their families. Thank you to all the troops and their families! I like Faithful Provisions and Army Wives on Facebook. A huge thank you to our service men and women. God bless you! My brother is in US Navy. Keep our troops and Nation in your prayers. Really enjoy your newsletter and posts on facebook with such helpful tips. I don’t know of any Army Wives, but I have a few friends that are in the Army and these women have families of their own. Super brave women! Unus Sed Leona follows you and Army Wives on Facebook! I think individuals and their families who are in all branches of our military are incredible. Thank you so much for serving and sacrificing for us. Thank you to all the Army wives out there! I am so grateful for the sacrifice of many so I can continue to live in a free country! A big thanks to all those who serve family members included what would our country be with out them and the sacrifices they and their families make every day. I ♥ both faithful provisions and army wives on FB. I signed up for your newsletter. Thankyou! My love & gratitude go out to all our troops and their families…I wish them all a safe return home, and soon! am following you & army wives on facebook…. Thank you to our Troops for keeping this nation free. We are such a blessed country to have such dedicated servants! Special thanks to all our troops!!! I already receive the email newsletter. Thank you!!! Thanks to all of our self-sacrificing troops! I receive the newsletter via email! I follow FP and AW on FB. My nephew has been deployed in Afghanistan MOST of his children’s lives. He is a good man who has went above and beyond for his country and his family. He has been gone for about 8 years total and is only 26 years old. During one of his consecutive tours there was an explosion which killed some in his troupe. He was seriously injured along with one of his fellow soldiers. They survived, but barely. His body was encased with shrapnel. His arms, hands, and legs. He was life flighted to Germany where he stayed until he was well enough to go to Walter Reid Hospital where he continued to heal. He still has problems with his hands, legs and feet, but does not complain. He simply pushes through the pain so that he can provide for his family and protect his country. A true American Hero! Thanks for the chance to win. God bless our troops!! I have been reading and enjoying your newletter for quite some time and enjoy the minute or two of reflection i can get out of your bible verse. God bless. I receive your newsletter already and love it! Look forward to getting it everyday. Feel so blessed to be an American and for freedom! Thank to our troops for sacraficing everyday so we can be free! Gob bless all the soliders for their serivce to our great Country, and to the family members back home holding on until their safe return home. Posted this giveaway in my facebook status! God bless all the soldiers for their service to our great Country, and to the family members back home holding on until their safe return home. So proud of our troops and the families back home! Awesome, would love to win this. And thanks for reminding me of Army Wives’ premiere. Love this show. I’m an email subscriber also. Thanks for the opportunity. I’m a FP facebook follower also. Thanks to all our troops ESPECIALLY my wonderful hubby! I have 2 good friends in the Army – one stationed in Italy and one in Afghanistan. They are on my prayer list every day! I would like to Thank Our Troops for fighting for our freedom. Thank you military wives that support their husbands as they serve our country. Melanie is an AMAZING support to her hubby Patrick-overseas in the middle east as an Army Chaplain. Blessings Patrick and Melani and kiddos! I am subscribed to your newsletter-fabulous! I ‘like’ Faithful Provisions and Army Wives on fb. I posted the Kindle giveaway on fb…thank you!!!! I thank God for those who give themselves to serve our country. I’m also thankful for the women who stand behind their husbands and support our country when they are sharing the most important person in their lives. I truly appreciate and thank all our troops! God Bless!! The wives and husbands of the military are equally as important as our soldiers. Thanks for keeping their homefront together. I pray that God will bless the Army wives and the spouses of other military branches. Thank you for having so many opportunities on your website. This Kindle Fire would be a blessing. Thank you to each and every one of our troops! I am one of your email subscribers! Following you both on facebook ..
My sister-in-law is a Navy Wife and a big fan of Army Wives! I have several cousins who are in the armed forces and one special uncle who is in the National Guard. He is well in his 50’s and still serves. I admire his determination and dedication to our country as well as serving our Lord. He is a wonderful man and takes his jobs serious. Our children look up to him and he is a wonderful role model. Very blessed by the work done by our troops! I have 2 nephews in the Marines! I give all my thanks to them and those who fight for our freedom. Without them where would we be. A MILLION THANKS to ALL Military for a job well done! I get your email newsletter! I have a cousin that is an Army wife raising 2 girls! She does a great job at it!!! Thanks to all the army wives who have to move and transition from place to place while raising their families! You’re amazing. My dad was in the Coast Guard for 27 years – thanks to all the troops! I am very thankful to all the troops that serve our country. Thanks and God Bless al of them. I also follow you on Facebook.. I subscribe to your newsletter already and LOVE it! Already “like” Faithful Provisions on FB, just added Army Wives. So grateful for our troops and their families for what they do for our nation!! Thank you to all of our armed forces and their families. You are all true heros. Thank you to all who have served our country, and those that are still serving! We do appreciate you! Also, kudos to a great website! Thank you! Sure hope I could win one! Follow you every day! Love your website. Trying for that Kindle Fire!! Try two for today! Would love to win!! Thanks to all those serving in the military. I salute you and your families! We appreciate all the troops so much! Id like to thank my friend Candice who is a Marine Corp wife! Thank you to our troops! A huge thanks to all the troops for all they do and their families who carry on while heir gone! I follow you and Army Wives on Facebook. Thanks to all our servicemen and women who risk their lives every day for our freedoms. Without them we would not be able to enjoy the way of life we have. I would also like to thank all the families of those servicemen and women for their faithfulness and willingness to share their family members with our country. Thank you to my nephew, Sam, who serves in the US Army and has served overseas. Thank you for your service and for the protection you help give our nation! No matter what our opinion is about ANY war that our country may fight, may we never forget those who put their lives in jeopardy so that we may live FREE! Thank you to ALL that serve! My son is currently serving in the Army and is based in Korea. I know first hand the sacrifice they & their families make for our freedom, and I’m so thankful to them all. I subscribe to your newsletter…always fabulous! Peace and strength to troops and spouses of troops! So grateful for men and women willing to serve deeply. I posted the kindle giveaway link on my fb profile. Thank you!!!!! I’ve signed up to receive your newsletter! Shout out to my friend Lisa B – her husband is an army chaplain serving his first tour of duty. He’s a preacher who felt the call of God to serve his country as a army reserve chaplain. A heartfelt thank you to our troops and their families! I follow you both on facebook (Rust Hawk). I follow you both on twitter @rusthawk. Thank you troops for your service to this country. I am subscribed to your daily e-mail newsletter. I receive your newsletter. Love it! Thankful for a Granddaughter who serves our great country in the Air Force. She and her husband both serve. One stint in Iraq and soon to be in Russia. I have several friends who have husbands in the military, and I respect them so much! I follow you and army wives on facebook! I have been getting your daily emails for a long time and I Love them!! Lots of my friends are army wives and they are the strongest women I know! My heartfelt thanks goes out to all the troops serving our country who leave their wives and families behind to protect the freedom that we all take for granted. My prayers are with the troops that God watches over them and that they all return safely to their loved ones. Thanks to the troops and thanks for the giveaway! Here’s my comment saying I sign up for your newsletter! I ‘like’ faithful provisions and army wives on fb! Grateful for those who give up so much to serve….bless you, bless your families, especially your spouses and children. May God fill in the gaps of your absence in your family! A huge thanks to all of our troops! I like Army Wives on Facebook. I would love to have a Kindle. My daughter will be starting college next year and this would come in handy for the e-books. This message is to honor Lori, a military wife and friend. gratitude to my late mother -in-law, amry wife and army mom! Thanks for serving in Vietnam cousin Ted. God Bless America! God Bless our Troops and Army Wives. I’m a subscriber to your newletter which I learn from daily. Thank you to everyone in our military for your sacrifice. We appreciate it! Thank you too all of our troops! So thankful for our troops! I appreciate all the military does for our country! A great big “thank you” to all those serving, and those were are serving their families while loved ones deployed. Thank you to those who serve our country! Thank you troops!!! I pray for you every single day. Many, many thanks to our troops that are protecting our freedom. There are not enough THANKS in the world to truly show our appreciation for what the troops AND their precious families sacrifice for our country and our freedom. THANK YOU ! Have a precious couple, that have been seperated 3 times for his tours in Iraq. I have been amazed at all that she has been able to cope with and do with three young children. God has blessed and used them to share HIS love and lift up other families in need and the families of ones that lost their lives in the war in Iraq. God bless and thanks to each of you for what you do and the scarifices you and your families make. My very good friend from college, Kristi Mick’s, husband, Kevin Mick, just recently returned from another tour in Afghanistan. Kristi has three children and is a wonderful friend, mother, wife, etc. She is what I would call a definite life-long friend. Thank you to our troops, please bring them home safely! I support our troops and admire army wives for their strength! Thank you to the troops. Posted your giveaway on Facebook. A heartfelt thank you to the troops. Follow you and Army Wives on Facebook. Thank you to all of our troops! I love army wives, I forgot when it came back on. I was actually looking for army wives when I found this, Great Giveaway!!! I signed up to your newsletter. I ‘like’ Faithful Provisions and Army Wives on facebook. I posted the kindle giveaway link on my facebook status. God’s blessing especially on the families, marriages and children, of those who sacrifice for a cause greater than themselves. I subscribe to the faithful provision email newsletter. I want to say thank-you to all of the troops and to their wives who stand behind them!!! A heartfelt thank you to our troops and their families. Following both on fb as stacey bico. I admire and respect our troops. So grateful to our troops and their families for all their sacrifices so we can live the way we do. Thank you to all the men and women serving our country! I don’t watch much tv, but thanks to your review I’m going to start watching Army Wives. Thank you for sharing all of the info you do that touches so many lives. Thank you to my husband, who serves in the Air Force. I so appreciate what you do! Many thanks to our troops and for all that they do! I know women who are army wives, including my cousin, so I like that the TV show shows a little bit of what they go through as well. Thanks for the great giveaway, my birthday is March 18th so if I’m lucky enough to win I will be a very happy b-day gal! 🙂 Thanks very much. I am subscribed to your newsletter too! I subscribe to your newsletter and look forward to getting it! Thank you to all of the troops and their families. Pertaining to above I’m following via twitter as @momof2boysz. Also following both fb accounts as stacey bico. To military officers and the spouses who support their service: “Thank you for protecting us!” as my son puts it so nicely. I ‘like’ both Faithful Provisions and Army Wives on facebook. I posted the Kindle Fire Giveaway link on my facebook status. Thank you! Thanks to our troops. We appreciate your sacrifice to protect our nation! I have liked Faithful Provisions and Army Wives on Facebook. To all who serve, and their families, thank you very much! Thank you for the wives that support those who serve – as well as the men who have wives who serve! My friend Jazmine is a very young Army wife with a new baby. She is in a new town and trying to finish college. She has so much on her plate at such a young age. She is STRONG and makes me proud. She is supporting this country just like her husband!!! We have some wonderful young adults in this country and we are blessed because of their sacrifices. Thank you to all the families who serve our country!! Follow you on FB and Twitter! I also follow Army wives on Twitter and Tweeted about this giveaway. Thanks Kelly!! So thankful for our troops and the daily sacrifice they and their families make for our country. GOD BLESS THE USA! Thank you to the men and women who give their lives daily for our freedom. My neighbor is an army wife of 2 young boys. I don’t know how she does it! Following both facebook accounts as stacey bico. Former army wife. Loves your blog. Hope to win!! Thanks to all those who served and are serving! I just want to thank our service men and women for all that they do!